Monster Ronson's Ichiban Karaoke: BERLIN BRUISERS VIOLET VARIETÈ PART DEUX! THE BERLIN BRUISERS' VIOLET VARIETÉ: PART DEUX!! Get out your datebook, because you won't want to miss this! 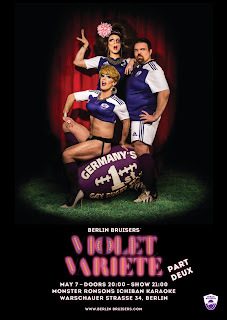 On SATURDAY, MAY 7, your Berlin Bruisers are putting on another rendition of the wildly popular Violet Varieté! We present some of Berlin’s most incredible acts, featuring the diverse talents of a whole range of stars: from singing and drag to boylesque and comedy-- A night of international artists and the most colourful rugby team in Berlin! Doors open at 20:00 and your donation will help support the Bruisers and spread their message of acceptance and inclusion in sports. You can expect to see some of last year's favourites grace the stage again as well as some new performances that are sure to wow you! Check out the lineup below. After the show, we throw the stage open to you - Monster Ronson’s karaoke will be running all through the night so grab that microphone and show us what you got!!! We can’t wait to welcome you to this incredible night! All proceeds go 100% to supporting the club so tell everyone you know and let’s have a party! KAAN TABAK and THE RUNNING BEAR will each entice you with captivating Boylesque dancing. Musical performances by THE PET SHOP BEAR CHOIR and JON CAMPBELL are sure to have you cheering for an encore. Comedians MANDIE WILSON and LILIANA VELASQUEZ are guaranteed to make the audience roar with laughter. BRONWEN PATTINSON, contortionist extraordinaire, will push the human limits of flexibility and agility. Three of Berlin's most popular drag superstars, MAZY MAZELTOV, FANNIE HEADÄK and ABSINTHIA ABSOLUT, will be serving up a lip-synch extravaganza that's sure to leave you gagging for more! Invite all your friends-- this is an event that is NOT to be missed!